Gamecube Online - View topic - Scored a Panasonic Q. Topic: Scored a Panasonic Q. Well I was looking for a Japanese console I could buy within European Union or in myCcounty of course because it hurts a lot the pockets when ordering things outside, not because of shipping costs but because of the customs :/, it�s a lot and besides takes ages to get in my hands. I couldn�t find any, only the switch JPN-NTSC GameCubes. One was a very good deal though I came across a Panasonic Q deal and I thought to myself, that�s it. Not only is it read Japanese games also is very cool item. But well I can�t afford to buy anymore things for the next few months probably. At least I�m back to both DC and GC online community, and still have a lot of games to play over the consoles I own. Ah! Also the seller �offered� me the Wave Race (JPN) game. Didn�t have it too . PS: Also posted in the "I have an orange Japanese GameCube on the way" thread again. How much did you get the Panasonic Q for? Also, does that system allow for network play? I was not aware the Panasonic Q had an ethernet port on it. Well was a bit expensive, but probably I couldn't get one for a better price anyway. I got it for 285 Euros (around 370 USD) but its complete and in good condition. Maybe I could get one for lower price overseas but with shipping costs and customs would raise the price above that I�m sure. Of course this may look much when looking at the US dollars price, but don�t forget that here as been always like this. The currency conversion for electronics (at least videogames) has been like the dollar has the same value of the Euro, so if a price of a consoles is for example 250 USD in USA, in Europe is 250 EUR (325 USD). And here in my country we have low salaries. Just for you to know the price I have paid for the Panasonic Q is a bit more than half of my salary (that I currently don�t have). The Panasonic Q has Ethernet port, in fact the bottom of the machine is exactly (or almost) the same as a regular GameCube. I havn't seen any pictures of the Panasonic Q's bottom. If you have any please post a link. I never got the Panasonic Q because I thought it didn't have ethernet ports. If if does, it looks like I will have to get one of these sweet machines. You guys are really lucky to own one of these, it's pretty rare to find one at reasonable price.But I guess I'll save some money for one too because I really want to own it.I'ts a lot cooler than normal GameCube, more stylish and has DVD player, definitely a reason to own it for every console collector.What should I know before I get it ? 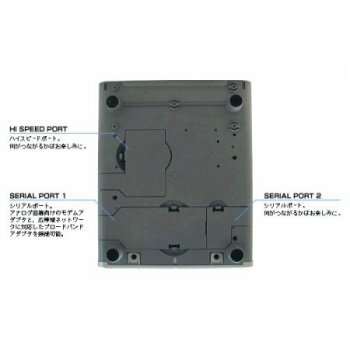 I've seen people have all kinds of modifications for it to play all region DVD-s, are these hardware or software mods ? I wouldn't like to have any hardware mods in my Q.And I've also seen english faceplate modification for remote, did it came originally with Q in box or someone made it by himself ? I'm really meticulous in these things, haha. My Q doesn't have any kind of mods, so only NTSC Zone 2 and free zone DVDs can be played on mine. I think the ones that are modified are hardware, but not sure what it is, maybe a chip. The english faceplate doesn�t come with the original Q.
I�m not sure where you live, but since you say your system is PAL you probably need a step-down (voltage) converter. so do you play your Gamecube games regularly with the Q? also i was wondering about the disc tray and how you insert the disc. does the GC disc feel secure when you place it on the tray? how does the machine run? is it quiet or maybe a little noisy? does it load GC games faster or anything? I got rid of my Panasonic Q because it started scratching my GameCube discs. I would avoid, and score a traditional import gamecube, or apply a region mod to a US system. I got rid of my Panasonic Q because it started scratching my GameCube discs. Serious scratches that got worse over time. It was like taking a razorblade and running it from the center, to the outer edge of the disc in a straight line. It was happening when the panasonic Q was trying to stop the disc from spinning and pick it up. It could have been an issue with just my Panasonic Q, but tray loading systems are the most common systems to cause disc scratching. ouch. well i hope it didn't ruin a good game of yours , thanks for the heads up. i think it should have been designed a bit differently to prevent disc damages like that. having the machine stop, start and grab those small GC discs seems unfair when the tray is clearly for holding DVD's. i was considering to get one, but if there's a potential it's gonna scratch my discs, forget that. Sorry for not been on much lately, been very busy and things not going very well. I don't play on my Panasonic Q for months already but I never had any problems with it yet, and I really like it.